How though, did John Harmon accumulate such a vast fortune from dust? Unlike the abstract ‘Shares’ economy upon which the newly-rich Veneerings and their peers precariously float (the vacuous, airy nature of which is suggested in the disclosures made at the Lammles’ honeymoon at the end of this month’s installment), dust is thickly material, comprised of discarded rubbish which bears yet the potential to be recycled and thus to generate new profits (more of which shortly). The dust mounds were also a very real presence in early Victorian London, scarring the landscape of the newly emerging suburbs. Early on in our introduction to the Wilfer family, we are told how Mr Wilfer’s home ‘was in the Holloway region north of London […]. Between Battle Bridge and that part of the Holloway district in which he dwelt, was a tract of suburban Sahara, where tiles and bricks were burnt, bones were boiled, carpets were beat, rubbish was shot, dogs were fought, and dust was heaped by contractors’ (25). Harmon’s dust heaps are likewise located to the north of the city: as Boffin tells Silas Wegg, Boffin’s Bower (or Harmony Jail, as it is more commonly known), is ‘over Maiden-Lane way—out Holloway direction’ (38). There is therefore a clear echo between the Harmon dust heap and the famous Great Dust-heap located at Battle Bridge, King’s Cross, which sat near to Maiden Lane (later York Road, present-day York Way), and which was dissembled in 1848. 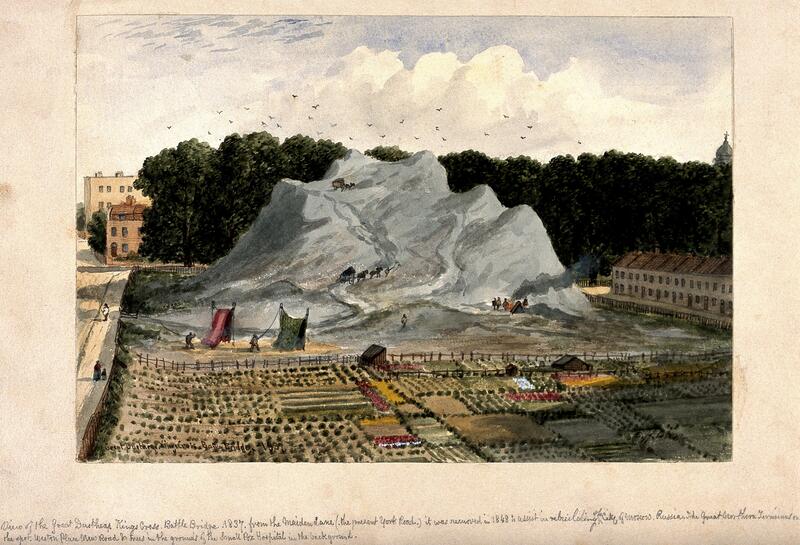 An 1837 watercolour by the little-known artist E. Dixon in the Wellcome Collection provides us with a glimpse of what this mound looked like, albeit from a more safely observed distance than Mr Wilfer experiences in his daily commute. The dust heap, a wash of grey colour that dominates the image, is uncanny: a man-made formation masquerading as a mountain, situated in an area on the anxious brink of change. The agricultural plots laid out before the foot of the mound signal its recent rural past, whilst the buildings are indicative of the urban spread that would take hold in Islington and Holloway with the development of the railways. The dust heap is marked with small numbers of human figures, who variously light fires and beat carpets at its foot, echoing the terms of Dickens’s description. Higher up, two carts pulled by donkeys or horses wind their way up a path cut into the heap. Whilst Dixon’s image gives us a sense of the scale of the dust heap, its perspective does not allow for any real detailing of its contents. A later inscription by an unknown hand on the base of the paper indicates however the potential value of its parts. It tells us that this is a ‘View of the Great Dustheap, King’s Cross, Battle Bridge. 1837, from the Maiden Lane (the present York Road) it was removed in 1848 to assist in rebuilding the City of Moscow, Russia.’ This provides a clue to the commercial value of the dust mound, which, comprised largely of fine cinders and ash, was sold on as material for the manufacturing of bricks (in this case, exported to Russia) as well as to farmers for manure. The cinders and ash were collected from London households by dust-contractors equipped with both the means to transport dust and a plot of waste ground on which to deposit it, working under contract from local parishes. As Henry Mayhew observed in his 1850-52 series London Labour and the London Poor, these ‘are generally men of considerable wealth’ (193). In July 1850, shortly after the removal of the Great Dustheap to make way for the building of King’s Cross station (part of the newly commissioned Great Northern Railway), Richard Henry Horne published an article in Dickens’s journal Household Words, titled ‘Dust; Or, Ugliness Redeemed’. The piece merges documentary reportage of observed dust heaps with a retrospective description of the now absent ‘great Dust-heap’. The chief value of the heaps generally, Horne notes, is ‘for the making of bricks. The fine cinder-dust and ashes are used in the clay of the bricks, both for the red and grey stacks. Ashes are also used as fuel between the layers of the clump of bricks, which could not be burned in that position without them’ (382). He notes that the brickmakers at Uxbridge would contract for fifteen or sixteen thousand chaldron of cinder-dust. Horne is however also fascinated by the diverse nature of the stuff the heaps are comprised of. Their accumulation ‘from the contents of all the dust-holes and bins of the vicinity, and as many ore as possible’, means that they present ‘very heterogeneous materials’. Indeed, they are ‘a wonderful compound of things. A banker’s cheque for a considerable sum was found in one of them. It was on Herries and Farquhar, in 1847’. The promise of riches that might be yielded amongst the rubbish gives rise in turn to a scavenger economy, and Horne focuses on the lives of the sifters and searchers who try to make their living from dust, sifting its contents and identifying objects – including dead animals – that might be resold. 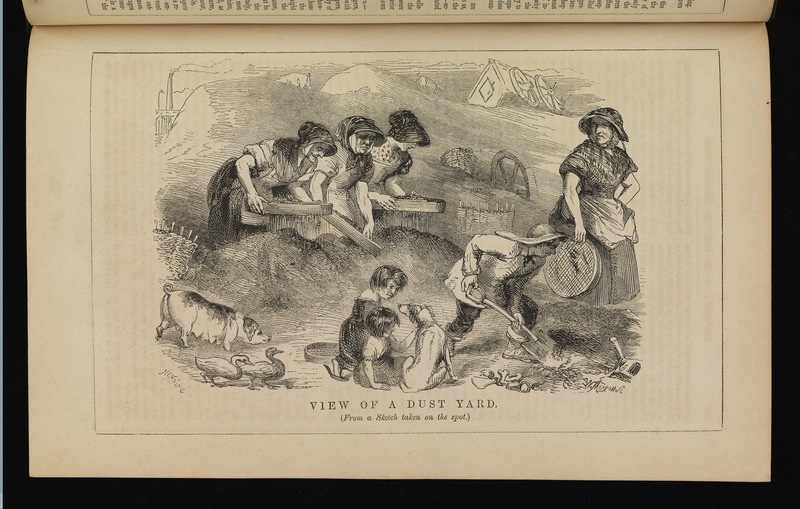 Horne’s sympathetic account of the community of dust-sifters, as well as his suggestion of the dust heap as a repository for treasures and fortune, gives impetus to Dickens’s novel more than a decade later. Dickens found and recycled the bones of his story from a somewhat mythic tale of the great Dust-heap provided by Horne. Horne details how a Mr Waterhouse was pulled from a canal by three dust-sifters, Jem, Peggy and Gaffer, after he attempts to commit suicide following the loss of his title deeds. Revived by the dust, he then recognizes his title deeds contained within a gold frame Jem has discovered in the mound. Grateful to the three sifters, he uses his newly found fortune to purchase them a cottage, and then falls in love with the daughter of the dust mound owner, who agrees to settle on them £20,000 following their wedding: leading to the sale, it is suggested, of the heap in 1848 for £40,000 to Russia, as well as a prompt to Dickens’s literary imagination. Here we have seedlings of the novel’s story (fortunes and relationships threatened by drowning and made by dust) and characters (the scavenger Gaffer). Moreover, Horne’s tale, as Catherine Gallagher points out, illustrates the mythical power of dust to revive, and provides Dickens with the opposing forces of dust and water as redemptive versus destructive forces which structure the novel (110-11). rags and Paper may be said to occupy places in a circle of the following description: Civilization invents various and abundant clothing ‒ the wear of clothing terminates in the production of rags ‒ Rags are transmuted into Paper ‒ Paper supplies the incessant Press, and the various activities of the Press sustain and extend Civilization. Where therefore society is most civilized there will be most Rags for the Paper Maker, and most demand for his Paper; but it is found that the demand for Paper in such countries is greatly in excess of the supply of Rags (5). A concern for the effect of economic vicissitudes as well as the substance of paper (the stuff it is made of) can be traced throughout Our Mutual Friend. As a site connected to the paper trade, the dust heaps signal where the matter of the novel begins, and as we continue to move through the world of the novel, we will be connected with this trade in other, significant ways. Thank you so much for this really fascinating post, Heather. It’s wonderful to have our attention drawn to Dixon’s sketch and to Horne’s really fascinating piece. It’s interesting to imagine Dickens going back to the Household Words article when he was writing OMF, supplemented with his own knowledge and recollections and his, now well-known, fascination with stories of misers and people we might now perhaps identify as compulsive hoarders. I’m astonished that dust heaps could have proven so fantastically lucrative. A quick, unscientific Google search suggests that the phrase, ‘Where there’s muck there’s brass’ originated in the mid-nineteenth century, and the extraordinary wealth-generating capacity of dust sorting must have contributed to its genesis, I’m sure! Your mention of Uxbridge is intriguing on a personal note as that’s where I grew up. I didn’t know there was a Victorian brick-making industry in that part of west London, but the website of a local historian – http://gerald-massey.org.uk/Canal/c_chapter_10.htm – suggests that 5 million bricks per year were produced in and around Uxbridge and then taken by canal to Paddington. There is, near Little Britain Lake in Cowley, a still very visible rubbish heap, which now looks like a rather awkward hill, replete with cracked chamber pots, broken glasses, and discarded plates from the Victorian and Edwards eras. Hi – Dickens also borrowed from the plot of ‘The Dustman’s Belle’, an 1846 play. In the play, a simple dustman is left a fortune by ‘Thomas Windfall’ (a wealthy dust contractor); then predatory ‘friends’ try and cheat him; and the end contains the moral ‘people ain’t always happier because they’re richer’. Not sure how widely this is known; but the parallels are striking. Terrific essay — thank you. Were dust mounds of this magnitude special to England, or a widespread feature of the 19th century urban landscape? And how were they phased out? Thank you so much! I’m listening to Our Mutual Friend at Librivox, read by the delightful Mil Nicholson. Your article is very helpful in better understanding the story and the life in Dickens’ time. I am reading Our Mutual Friend and this has proven to be very useful reading. Its just precisely what I was looking for to clarify a few points on the story. Thank you very much !